Vander Roest, Virginia May age 89 of Walled Lake was born June 27, 1929 in Richland, Michigan to George C. and LuLu Martha (nee: Disbrow) Pillars. She died April 10, 2019 at the age of 89. Mrs. Vander Roest is the beloved wife of the late Dr. William E. Vander Roest (d. 1970). Loving mother of Wilfred, Charles (Ellen), Martha (Andrew) Campbell, Laura (Wayne) Smith, Caroline (Jeffrey) Bernotski and Paul (the late Daniel Bumgarner) Vander Roest. Also 10 grandchildren and 9 great grandchildren. Dear sister of Mildred VerMuelen. Preceded in death by 4 sisters and 2 brothers. Also survived by numerous nieces, nephews, extended family members and friends. Funeral from Lynch & Sons Funeral Home, 340 North Pontiac Trail, Walled Lake (3 Blks. S. of Maple Rd.) Saturday 10 AM. Interment East Cooper Cemetery, Cooper Township. Friends may visit Saturday 9-10 AM. Memorials to the charity of donor’s choice appreciated. 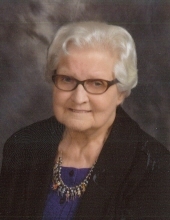 "Email Address" would like to share the life celebration of Virginia May Vander Roest. Click on the "link" to go to share a favorite memory or leave a condolence message for the family.